Athletes bound for Rio Olympics, including India's opening ceremony flag-bearer Abhinav Bindra and wrestling ace Yogeshwar Dutt, hailed the send-off given by Prime Minister Narendra Modi who interacted individually with each of them on 4 July. At a function held at Manekshaw Centre, PM Modi wished luck to each of the sportspersons for the August 5-21 Games. 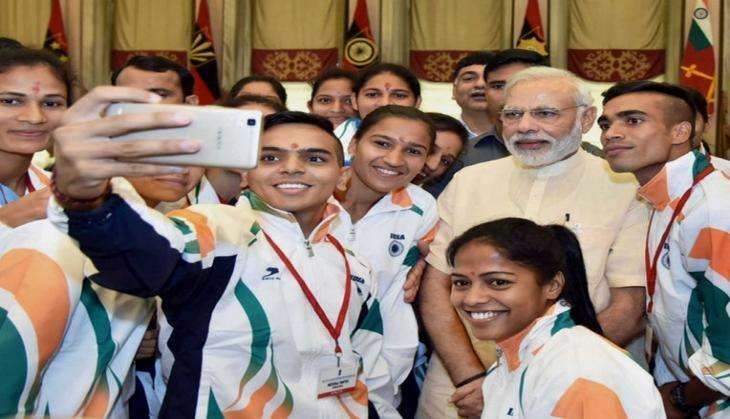 Later, the PM took to Twitter also to extend his good wishes to the sportspersons. He also responded to the tweets posted by the Rio-bound sportspersons. Bindra, India's lone individual Olympic gold medallist, who will make his final appearance at Rio, said, "For the first time ever there is a send-off by @PMOIndia @narendramodi for the Olympic Team. What a great gesture.#respect." For the first time ever there is a send off by the @PMOIndia@narendramodi for the Olympic Team . What a great gesture , #respect. London Olympics bronze medallist grappler Yogeshwar also thanked the PM for his gesture. "It was great gesture from our Honourable Prime Minister to wish athletes personally. Something like this has never happened. So, it's a great encouragement for all of us." Thanking the PM for his support, young boxer Shiva Thapa wrote on his twitter handle, "Great to meet our Honourable PM Shri @narendramodi ji..Thank you for all your support.jai hind." "Meeting PM Modi was motivating and encouraging, hope to bring at least 2 to 3 medals, from the Rio Games," she said. Shooter Heena Sidhu tweeted a photograph along with the PM, with the caption reading: "Send off to #RioOlympics by the Prime Minister #NarendraModi. We all had a good time." "Glad 2 meet our energetic #PM @narendramodi Ji in a pgm. Ur words gv us energy 2 bring laurel 4 country in #Rio," was the tweet posted by boxer Manoj Kumar with a photograph with the PM. Several of the Olympics-qualified athletes were, however, not there at the send-off function as they are currently training abroad. India is sending its biggest ever contingent at the Rio Olympics with more than 100 sportspersons having qualified for the Games so far. Other sportspersons who were present at the send-off function include shooters Gagan Narang, Jitu Rai, Gurpreet Singh, Manvjit Sandhu and Ayonika Paul, gymnast Dipa Karmakar, archers Atanu Das, L Bombayla Devi and Laxmi Rani Majhi, track and field athletes Inderjeet Singh, Sudha Singh, Lalita Babar, O P Jaisha, Kavita Raut, Kheta Ram, Nitendra Singh Rawat, Baljinder Singh, Chandan Singh and T Gopi, and table tennis players Mouma Das and Manika Batra.